The East Gosforth online ward event survey closes this Wednesday and the East Gosforth Annual Ward Priority Event for all residents is on Monday 18 July. They will help determine how the East Gosforth ward budget of £5,630 is spent, and they’re important ways to have your say for your area. Each ward in the city now has a survey and event rather than the previous system of four ward meetings per year. This new system results from recent changes to the council wards in Newcastle. West Gosforth and Parklands residents will have the same opportunities later in the year. Here’s some background information on air pollution, accident statistics and traffic data in East Gosforth which we hope will be helpful for East Gosforth residents completing the survey and attending their event. 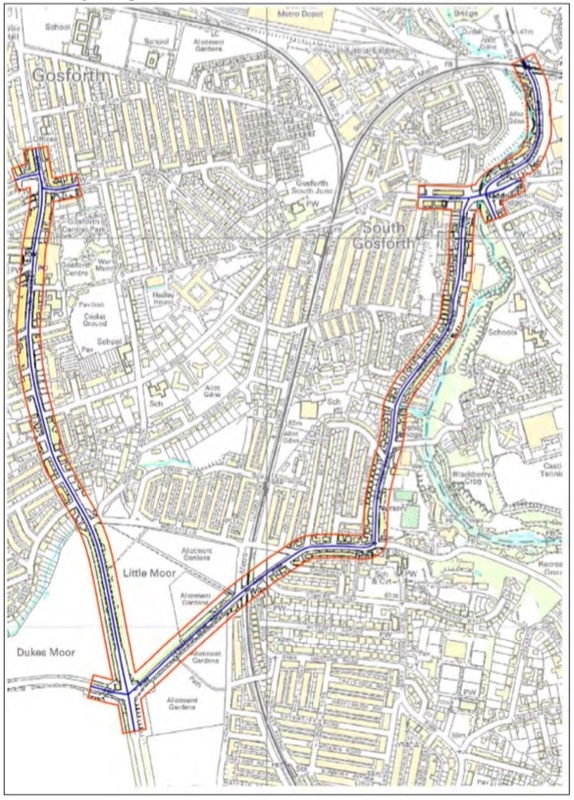 The map below shows the South Gosforth Air Quality Management Area. This zone follows the eastern, southern and western boundaries of East Gosforth Ward. Local authorities declare Air Quality Management Areas (“AQMAs”) when they believe they are unlikely to achieves their objectives in managing air pollution, and they also have to create a Local Air Quality Action Plan to improve air quality. Newcastle City Council created a Local Air Quality Action Plan for South Gosforth in 2011, and in 2013, they published an Air Quality Progress Report for all of the city’s AQMAs. 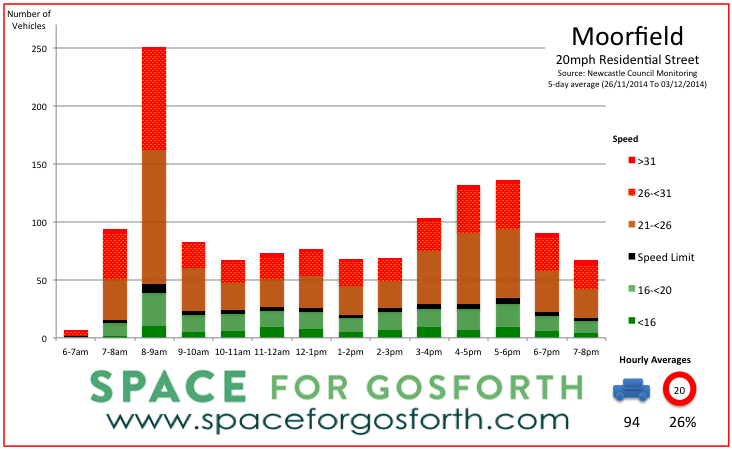 More recent information about air pollution can be found in SPACE for Gosforth’s own monitoring on Gosforth High Street. 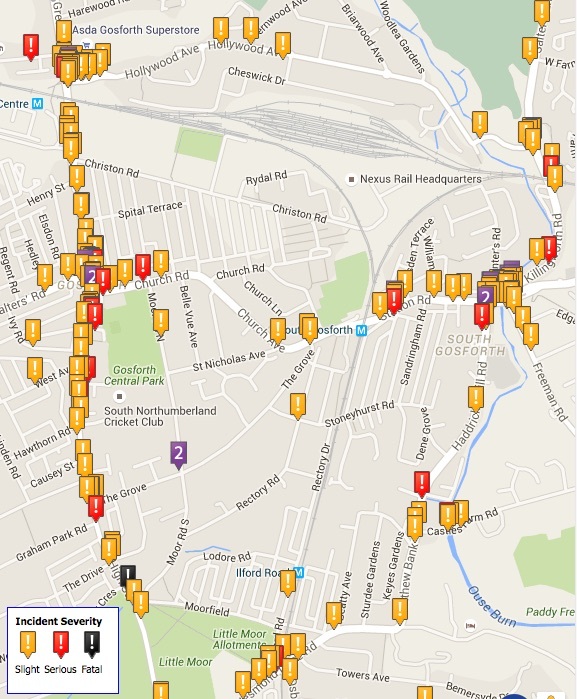 The map below from CrashMap, shows the locations and the severity of casualties resulting from collisions in East Gosforth. Some areas of the East Gosforth Ward have a good record for safety, in particular the Terraces area (the area between Church Road and Christon Road), where many of the streets are access only. CrashMap also shows that East Gosforth has clusters of casualties at its major junctions which include Gosforth High Street / Church Road, the Blue House roundabout and Haddricks’ Mill roundabouts. The major routes that feed into these junctions also show large numbers of casualties. The speed camera on Gosforth High Street next to the Little Moor recently made the local news due to the number of drivers receiving fines from that camera. In 2014, an average of 18,676 vehicles passed through the High Street each week day. This figure is from the TADU website, which also shows that the average for Matthew Bank was 19,222, and for Station Road 14,794. 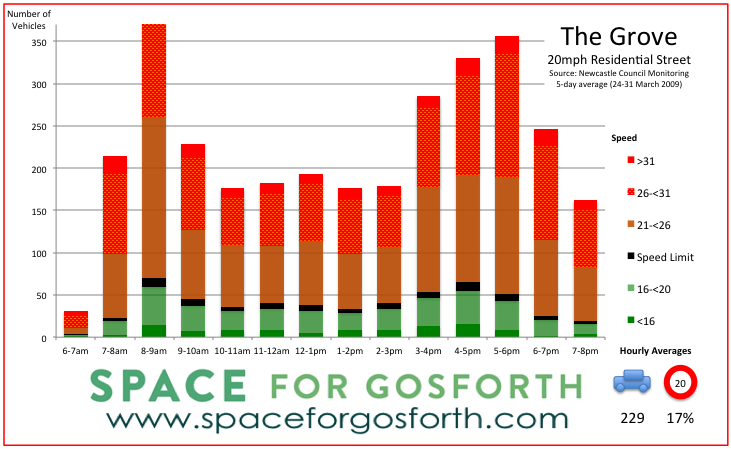 SPACE has also published graphs about the volume and speed of traffic on some Gosforth’s back streets, which included two streets in East Gosforth. These graphs were produced using Newcastle City Council’s traffic count data. One of these streets, Street C (Ilford Road), showed a high volume of vehicles using this street, many of which were travelling faster than the speed limit. You can find out more about the effect of speed on injuries sustained in a collision in this previous post. 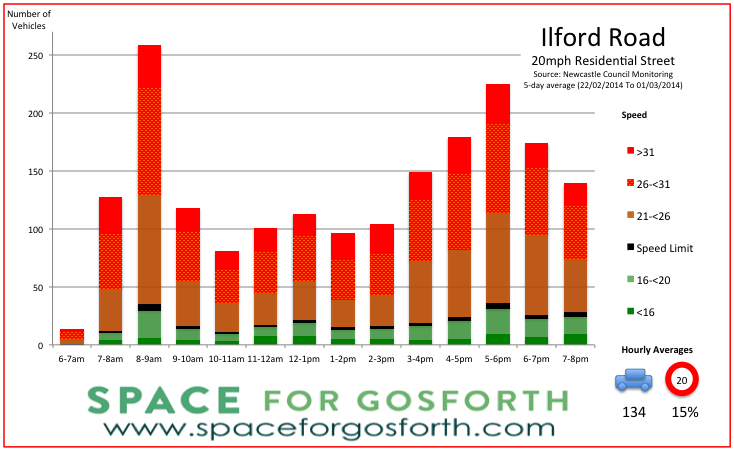 We have reproduced the graph for Ilford Road below, and also added other graphs for other streets in East Gosforth that share these issues. The scales on these graphs vary due to the number of vehicles using each street. Each graph states the average number of vehicles using that street per hour, and the percentage driving at or below the speed limit of 20 mph. Since data for some of the streets was collected there have been changes to their traffic management. It will be very interesting to see how these new arrangements affect traffic. If you live in these streets* maybe you’ve noticed a difference? If so please let us know. Ilford Road is one of the access routes to South Gosforth First School. The heights of the bars in the graph show the number of vehicles that passed in any given hour, while the colour shows the speed. Green denotes below the speed limit, with brown or red representing vehicles travelling greater than 20mph. The traffic count recorded 2,074 vehicles on an average weekday, and shows a noticeable increase of traffic in both the morning and evening rush hour, a trend shared by the other streets. The second street is Moorfield. This data was recorded in November 2014 before the Moor Road North became no entry to traffic entering from Church Road and before the priority was changed on the junction of Moor Road North / South with the The Grove. This daily average for Moorfield was 1,417. Approximately half of this traffic was east bound, which must have come from Moor Road South, part of the existing cycle route which links the Little Moor to Gosforth Academy. 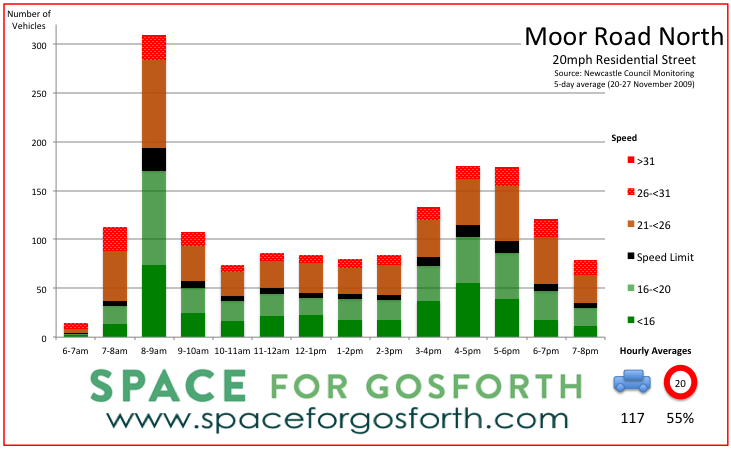 This graph shows that 190 vehicles accessed Moorfield from Moor Road South between 8-9am, exactly the time when many children travel to school. This data is from 2009, and was taken before the street’s northern junction with Church Road became no entry. The daily average for Moor Road North was 1740 and over 1000 of these vehicles were heading south. During the morning peak between 8-9am 175 of 253 vehicles were southbound. These figures are likely to have been affected by the Church Road junction becoming no entry to southbound traffic. Again, this is older data from 2009, recorded before the changes to priority on the junction with Moor Road. The daily average for the Grove was 3,496 vehicles. This is also older data is from 2008, and the 20 mph speed limit on Hollywood Avenue at that time was only advisory and not enforceable (unlike the other streets). The daily average for Hollywood Avenue was 8,127 vehicles. In addition to the mandatory speed limit becoming 20 mph, the other key change since this data was recorded is that Hollywood Avenue no longer has priority over the northbound Great North Road at the Regent Centre junction, which may make it a less attractive through route. 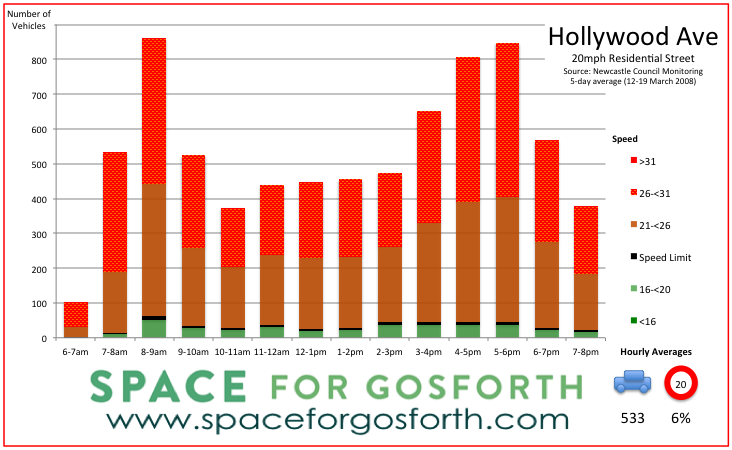 Join SPACE for Gosforth. You can find us on facebook space.gosforth and twitter @space4gosforth and register for email updates here. Why couldn’t you use up to date data? It would make this website a lot more useful and reliable. Thanks for reading and commenting on the article. We are always happy to publish relevant data so if you are aware of anything more recent please do let us know either via the comments page here or via the SPACE email address. Likewise if there is a particular use for this data you had in mind please say. The TADU website (http://www.gateshead.gov.uk/TADU/home.aspx) has the most recent traffic and cycle volumes for Newcastle. The Crashmap website (link http://www.crashmap.co.uk/) also has the most recently available data on casualties. The speed/volume graphs for specific streets are from one-off surveys. We’ve deliberately included the dates these surveys were undertaken so that it is clear which are recent and which are less so. If you think the traffic speeds and/or volumes on these streets have significantly changed we would be interested to get your view on what you think has changed and why. For Hollywood Avenue, the traffic using it as a through route seems to have increased greatly to me since 2008, to the extent of sometimes causing delays on Salter’s Lane / Killingworth Road, as there is a queue all the way from the (single lane) bridge to the main road.